In recent results on linear systems subject to actuator saturation, characterizations of null controllable regions form a guideline for searching feedback laws. Null controllable region , which is also called controllable set, is closely relative with time optimal control . Null controllability of a control system is the possibility of steering its state to origin in finite time by an admissible control input . A formula for extremes of the null controllable region of a discrete-time system with bounded inputs has been presented in . An iterative approach for descriptions of the null controllable regions of continuous-time and traditional discrete-time systems with saturating inputs is found in  and , respectively. Null controllable problems on both continuous-time systems and traditional discrete-time systems subject to actuator saturation have been studied in  and , respectively. 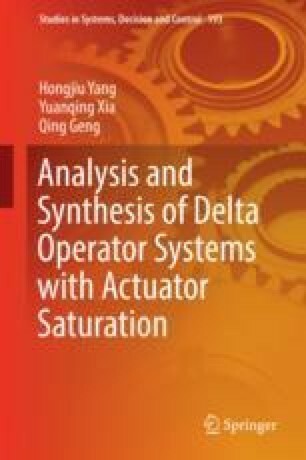 Some problems on the null controllable regions for systems with actuator saturation are important and challenging in both theory and practice, but the null controllable regions of DOSs with actuator saturation have not been proven yet, which motivated us to carry on this chapter.